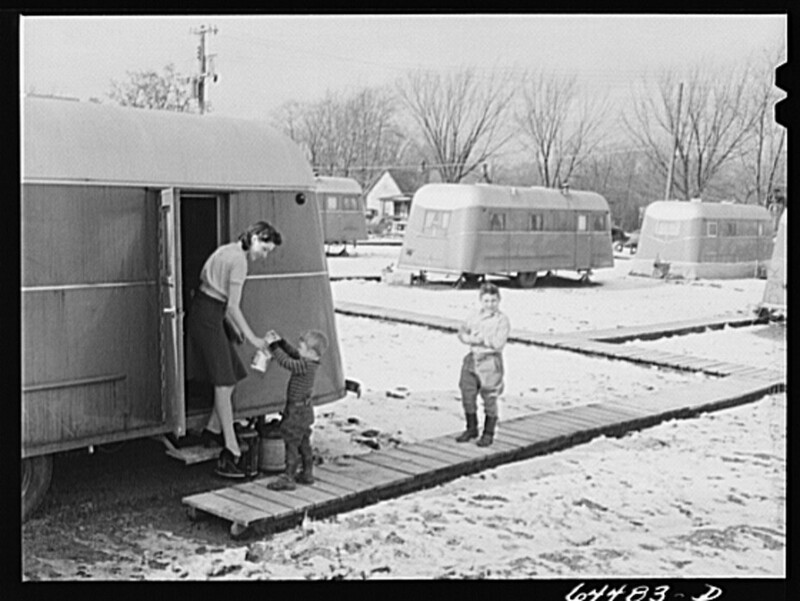 The early 1940’s was a challenging time for United States of America and trailers industry. Our country was headed to WWII and rations were put in place in order to produce the necessities needed for the war. The mass-produced trailer was still in its infancy – factories had just begun producing trailers in 1936 so there were only a few companies producing them and they were still trying to figure out the best designs and materials to use. Then, all of the sudden, trailers were tested on a broad scale due to WWII and unfortunately, the results didn’t fair well. 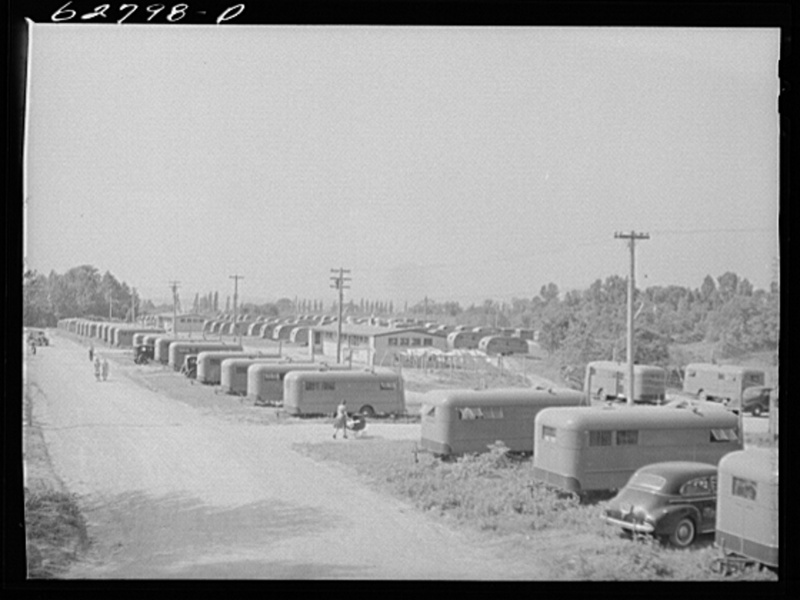 The federal government ordered thousands of trailers to house factory workers and soldiers so they could help produce all the materials and products needed to fight the war. The homes weren’t built to high-quality standards because the new industry simply didn’t have the experience or materials needed to do the job right. 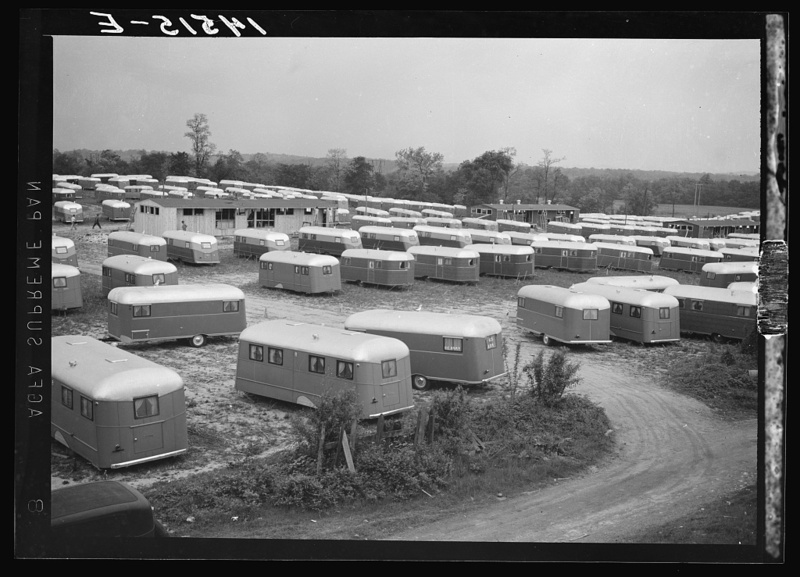 It took 2 years before trailer construction was classified as a housing necessity so the builders had to use non-rationed materials until the classification was finally corrected. It would be like asking your kid to build a dog house without access to proper wood! This is one of the biggest reasons trailers and mobile homes got such a bad reputation so quickly. The industry simply wasn’t prepared for the demand that WWII would put on them. The trailers had to be built in record time with a substandard material – still, the industry did it. They were able to step up and come through when it mattered most. 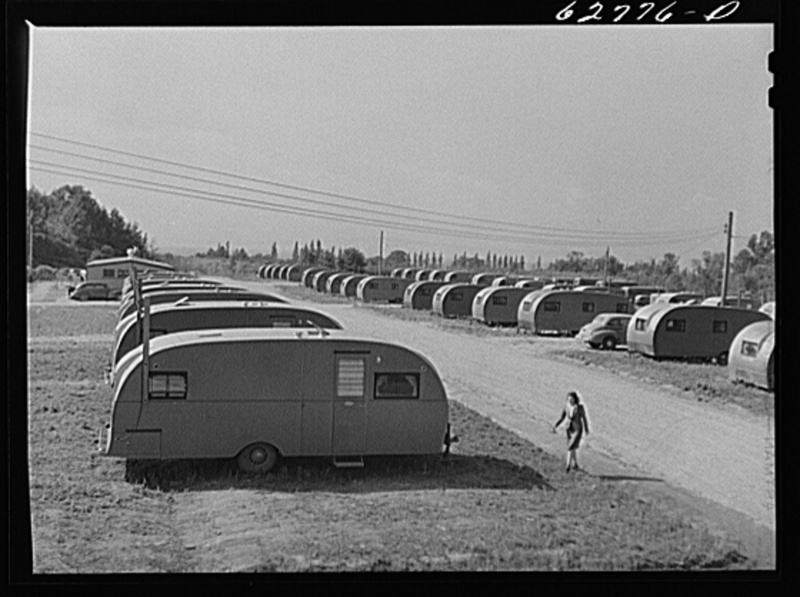 Thousands of soldiers, factory workers, and their families had never been around trailers before. Then they were suddenly living in these quickly (and poorly) constructed homes in a trailer park. This introduction to trailers left a lot to be desired! This situation is one of the biggest reasons trailers got such a poor reputation. Had the circumstances been different and the public been introduced to the homes in a different manner, I’m convinced the poor reputation wouldn’t have taken hold so tightly. Trailer park living was hard living and there were pros and cons for both the federal and private parks. There was rarely enough water and trash receptacles were often overfilling in both types of parks. Mud was a big issue in the parks during the winter and spring too. However, the private parks allowed the workers to build onto their trailers, or at least modify them so they didn’t leak as much and held heat better. In some of the federal parks, wooded sidewalks were built to remedy the mud issue but you couldn’t modify or build onto the trailers at all. Private park living was considered the better since you could reinforce and modify the homes. Related: Some Vintage Trailer Parks and Campground Images. 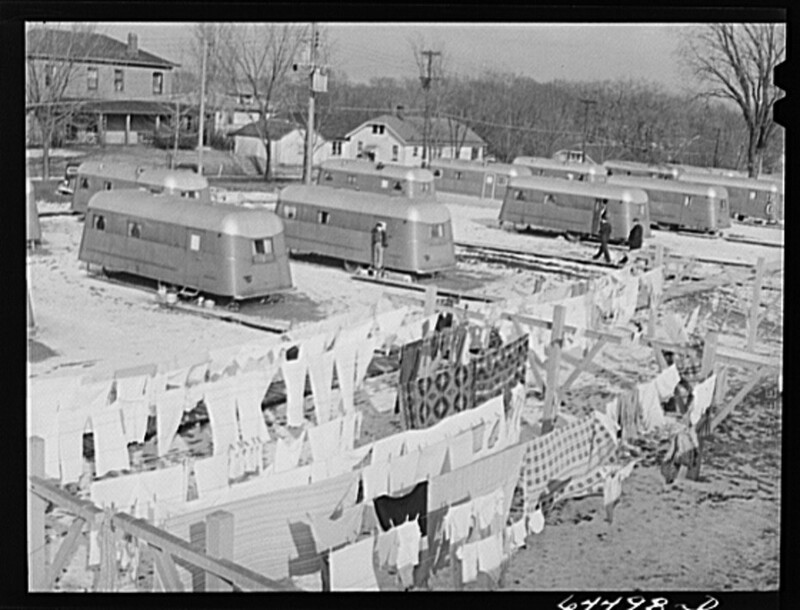 Below are photos from Burlington, Iowa in February 1942. This was a government park set up by the FSA. 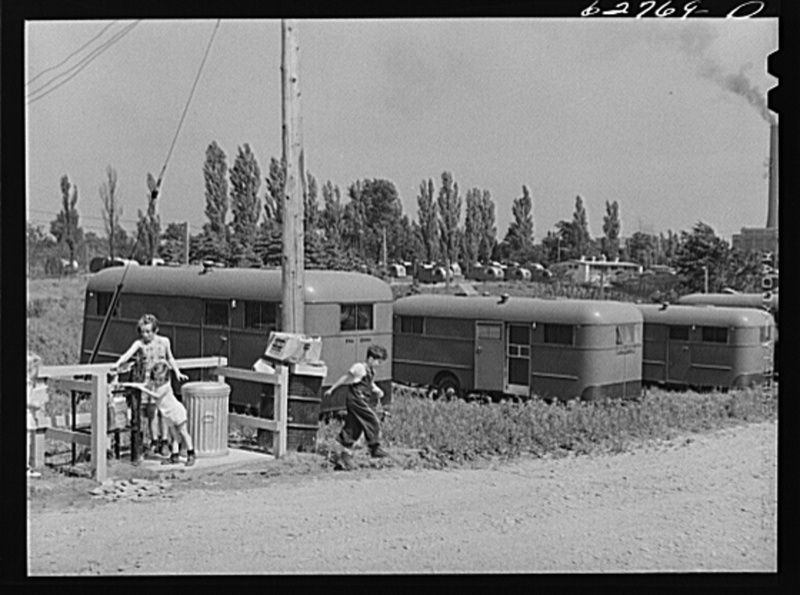 The next set of photos was an FSA (Farm Security Administration) housing project set up outside of Erie, PA. There was a power plant that needed lots of migrant workers to keep it going during the war. The people that lived in these trailers were heroes. While the trailers weren’t perfect they did their part to help the country overpower evil during WWII. Yes, they could have been built better but the companies did the best they could under the circumstances. They helped America do what America does best – come together in a time of need. This is a very condensed version of trailers during WWII. I hope to one day publish a small ebook covering the subject in depth because I find it so fascinating. Mobile homes and trailers have been a part of our country’s history for the last century. They have touched us all in one way or another. They deserve to be respected and the truth known about them! Thank you so much for sharing this with me! I love love love this kind of stuff! Thank you! My parents lived in a trailer park city when Dad was in the Navy out in San Diego. Anybody have any information about that location – ?Bon Ami? near Chula Vista? Very unique and interesting website, as well as article! I have had an almost lifelong passion – I’m just now 60! – for anything and everything early 40’s, during WWII, and immediately following, particularly regarding living conditions on the Homefront and how that demand was met. I have seen several of these pictures before, on another website called “Shorpy” (consult the site regarding the origin and meaning of the name, if you’re interested) but several others are new to me. Equally interesting, all of them! Personally, I think the fairly primitive living conditions that people took up, and accepted “for the duration,” spoke well for the hardy stock from which they came, just that minute easing out of a decade-long Depression, and its attendant shortages and hardships. Since they weren’t​ strangers to such conditions, in spite of being quite weary of them, the nation’s call to arms, to 24-hour a day production of the materiel of war, hard work, shortages and deprivation, weren’t any strangers to them really. The previous generation – parents of these workers – having been through much worse during WWI, since even though the duration of our participation was shorter than other countries, our government had much less time, technology and know-how in getting such a job done. Everything had to be done in double-quick time, and there was much less to work with! The technology involved in producing the average airplane during WWI paled badly in comparison to what was involved in the then advanced technology of the early 40’s! A great deal more advanced technology was involved, not only in the assembly of the plane, but in the pieces and parts it took to build it. I guess my point is that we had come so far ahead between the two wars, that the short term advances that took place to produce the travel trailer/mobile home needed its own growing space and time as well. 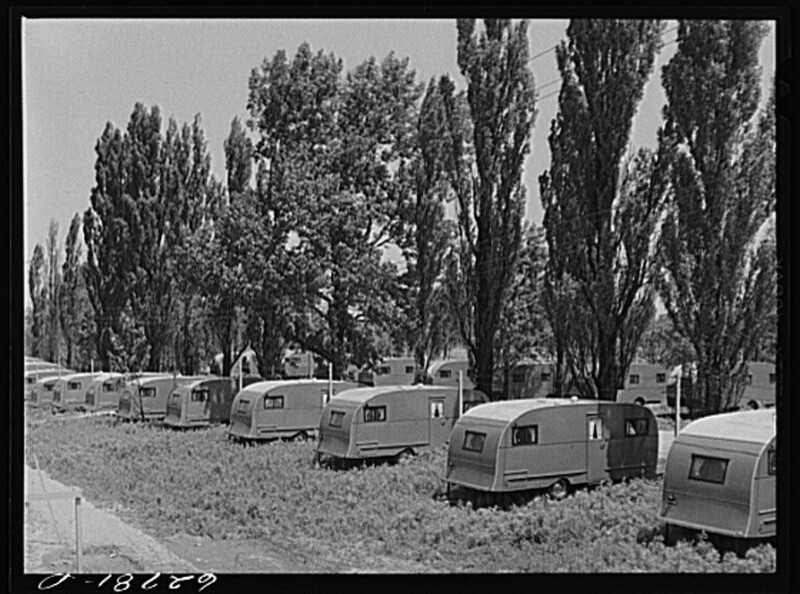 They were the most basic of shelter, just a few steps ahead of a “garage on wheels for people” when first pressed into service, and the lack of R&D by the time the War broke out and the demands placed upon them hurt them a great deal due to the initial lack of proper materials, technology and knowledge in how to build high quality units. People took what was offered, and gladly in most cases, because they were again not alone in such hardships. “Relative deprivation,” a term that came out of college sociology and stuck with me, explains why so many people were able to stand such conditions for so long. It was because each couple or family was not alone in the deprivation, they were all in it together, in large groups. It did no good – served no purpose – to whine and complain about their circumstances, because their neighbors were all in it together! Nobody else in their immediate vicinity had it any better or any worse than they did. They consulted each other for ideas on how to solve their own problems, since it was a matter of simple comparison that they all had it about the same. The focus was on how to best solve the nation’s needs for defense materiel, much less their own simpler requirements for living from day to day. Since none of those early “mobile homes” had indoor plumbing of any kind, W is isater was fetched from the nearest outside water spigot, carried in buckets or basins, used and then discarded outside as well. Laundry water likewise, and there were also no indoor toilets or showers inside the units either. Shower houses took the place of private facilities inside each unit. Children took to them just like any other “adventure” they could dream up! I’m sure also that after the War, just about any other kind of living accommodations seemed palatial by comparison! Thank you for that great article! I’d love to use some of those photos in a talk I’ll be giving in about a month, about how mobile homes and parks deserve more credit than many people give them. Do you know if these pics are in the public domain? If not, any idea how I can get permission to use them? Of course, I’ll mention your website. What a great job you’re doing here! I’m 99% positive these are public domain and probably available in the national archives. Best of luck! Thank you for this post. 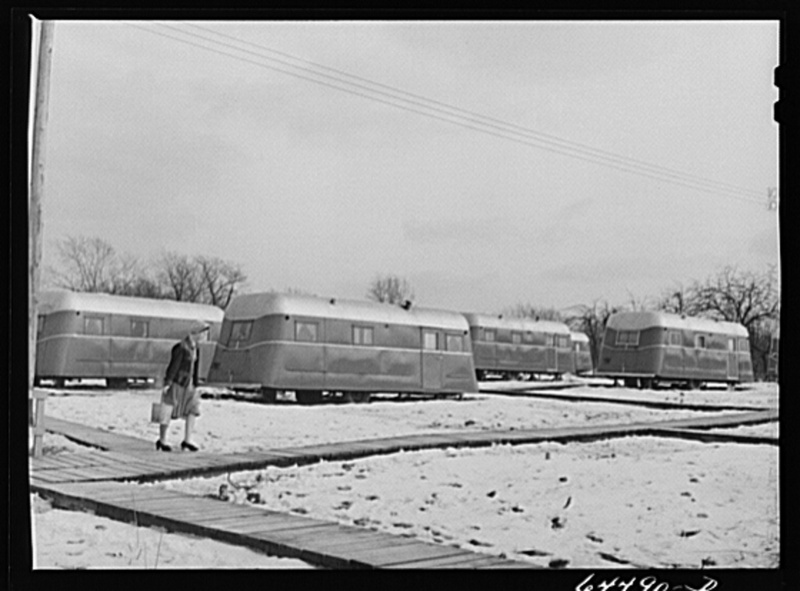 I never knew this history about mobile homes. Really enjoyed the article. I look forward to your book…. Thank you! It’s slow going but I’ll get it done eventually! Loved reading that. Thank you! Thanks for reading MMHL Sharon! I appreciate you!